Mustard is happy to work as part of the team or to lead from the front. We have successfully project managed a variety of IT projects over the years including many office relocations and would be happy to take responsibility for your office move. Mustard schedules most office moves to take place over a weekend. Our engineers are happy to work outside of normal office hours to ensure disruption is kept to a minimum and we’ll be there early on Monday morning to check everything is working as it should be. We are in the communications business and we like to practice as we preach. Mustard IT will liaise regularly with your office removal company, onsite contractors and third party suppliers such BT and Internet Service Providers to make sure everything runs like clockwork. Moving office can seem as daunting as moving house – in fact, it may be worse. But it’s a process like any other, and Mustard IT can help you break it down into manageable chunks to ensure everything runs to plan. Mustard consultants will begin by visiting your new location, at the earliest opportunity, in order to conduct a full site survey. The next step is to scope out all IT and telecommunications requirements, liaising closely with fit-out companies and other contractors to ensure ample provision is made for network cabling and power. One of the most common causes of delay, when moving your office IT, is failing to allow sufficient time for new phone lines and internet services to be installed. Mustard engineers will ensure that these and other important decisions are taken at the right time to ensure everything goes to plan. For a problem-free move, just leave the management of your office relocation to Mustard whilst you get on with running your business. 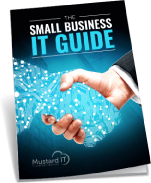 When relocating your business network, it is essential to put together the right project management and Mustard is ready and able to take full responsibility for your IT infrastructure and telecommunications.